2 Years Since Isis' Accident! 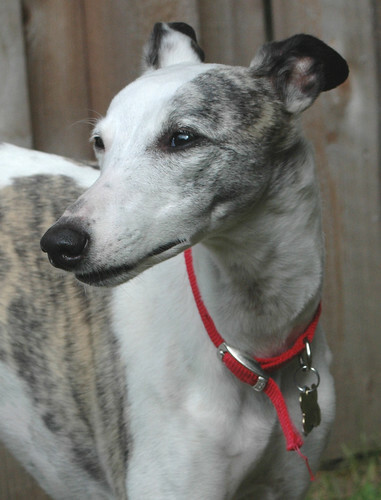 I can't remember if I've mentioned it before, but one of our whippet dogs - Isis, had an accident 2 years ago that left her paralyzed and then the steroids to treat that almost killed her because she had a heart condition that we didn't know about. The vet gave her days, weeks, maybe a couple of months to live. 2 years later, she's still going strong!! Last weekend was the 2 year anniversary of her accident. We just LOVE this little Girl and treasure each and every day we get to have with her. 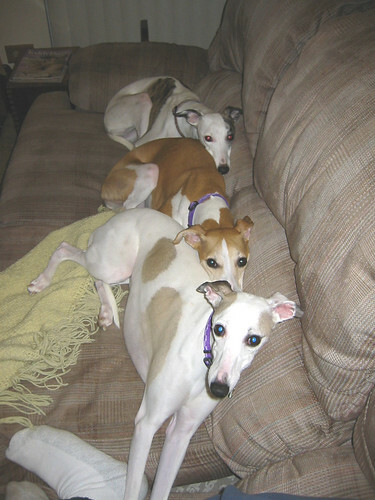 I posted more about her on our Whippets' Blog. A Cold Rainy Day... good to stay in BED! Ugh, it's cold and rainy today -- but that cold front should push these rain clouds away. It's just a good day to stay in bed. I'd love to go back... hubby got us up earlier than usual as he had to be at work early. I wish I could stay inside all day and work on one of my custom orders! But I do have a couple of errands that need doing.. I should get those done right away so I can stay inside the rest of the day! Well, with the exception of taking all 5 dogs outside for their breaks. And they do NOT like rain! He's finally done! This is Ringo. I've had him designed and drawn out onto the mohair for quite a while, but had not gotten around to finishing him till now. Ringo is the prototype for a new pattern that I have available for sale on my Patterns Site. 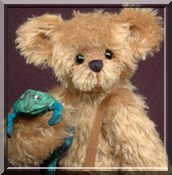 Ringo the finished bear is also looking for a new home. 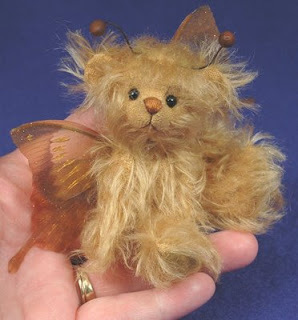 He can be found on the Bears for Adoption page of my site. He may go to eBay on Tuesday...I'm not sure yet. I think Spring is Here to Stay in Chicago! We're supposed to get one more great day on Saturday - sunny and 70's - but more importantly I don't think we'll get any more snow LOL! This week I was able to finish up 2 custom bears for my doctor and have started on another custom order bear - but I hope to have another bear for the website sometime next week. Update to the "Fishy Email"
One of my bear artist friends did some further research on the Lakeshore Ministries manner and found some very disturbing news which further justifies our bad feelings about these people. I've edited yesterday's post with the additional information. Keep away from these people and keep them away from kids!! We're posting this so everyone we know will be aware of these scam artists. I say we because several of us worked on this and are now spreading the word. Sorry these last 2 days have been downer of posts... but it's important to know. What a Great Book on Sewing Artists Studios!! 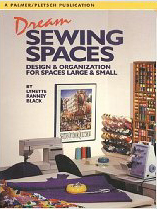 I was searching around on Amazon for back issues of the Stampington Magazine - Where Women Create and found this awesome book - Dream Sewing Spaces: Design and Organization for Spaces Large & Small. I am fortunate enough to have a room dedicated to my studio. Well, studio & office. The computer desk takes up one entire wall - and both my hubby and I have to share that. We each have our own laptops, but the bill paying stuff has to go somewhere! This book covers ideas for entire rooms... large or small and also has ideas for (taken from the table of contents) The Guest Room as a Sewing Room, The Laundry Room, Office/Sewing Room (hey, that's for me! ), From Dining Room to Sewing Room/Office, When All You Have is a Closet, Nooks & Crannies. I can't wait to order my copy!!!! Do you ever have recurring dreams? I used to have two. One was that a plane crashed in our back yard. The other was that a "mean" dog that looked like our dog ran into our house and started a fight with our dog. I don't have either of those dreams anymore, but I do still have a recurring dream. That is that I am setting up at a bear show and I realize that I have forgotten to bring my BEARS! The dreams are always a little different... different shows, different cities - but always it's me forgetting my bears LOL! Actually I have a check list for when I'm getting ready to go to a show - and you can be sure that the BEARS on are on the list! In fact, they are at the top of the list LOL! I was very surprised with myself! I managed to list these Teddy Tag-a-Longs on my website today before 9am LOL! 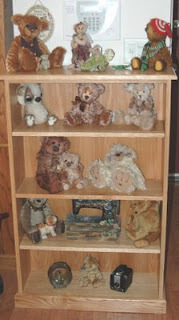 I've got some special order bears I've been working on, but have been able to fit these little guys in here and there. Yesterday was spent out at the Embassy Suites Hotel in Schaumburg, IL. Yep, the same place where Daphne Blau and myself are hosting the Chicagoland Teddy Bear Show this October 24th. Yes, I know - the show is still 6 months away! There are still a lot of details to take care of and it is much easier to take care of a few at a time over time - than to try to do them ALL in October! This hotel is just beautiful! It is going to be a lovely setting for this premier teddy bear event! Let me share just a couple of photos of the hotel...and now, I'd better get to making those bears! And I've started something new... I'm "Tweeting" on Twitter now! If you check out the section in the upper right hand corner there you can see "What I'm up to Today." 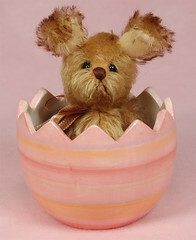 This is a One of a Kind set and cannot be duplicated - I've used up the last of his mohair and cannot find the eggs anymore. Cadbury is a wee mini 4" mohair bunny. 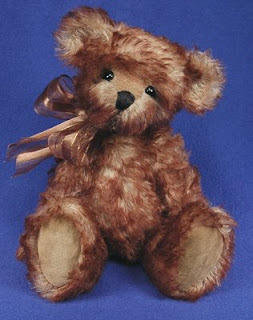 He was created from 2 colors of mohair: golden mohair and golden mohair tipped with chocolate brown. Sorry, Cadbury has been adopted! You can see more photos of him here on Flickr. Look what my hubby made me for my birthday!! I call it a "bear case" cause it will never be used to hold books LOL! It's solid oak with a natural finish to bring out the beauty of the natural color of the wood. If you want to see a larger version, just click on the picture. I had been wanting a case in this spot for a while. I walk by here all the time and I love to look at my furry friends as I walk by. The other "gift" I got (OK so I got it for myself LOL!) was an ebook. It's an electronic device to read ebooks. I LOVE this thing! This is why I won't be needing shelves for books anymore LOL!